The Happy Birthday Combo will bring the fun to your party with a large bouncing area and a basketball hoop. It has a climb ladder and slide that goes back down to the bouncing area. It has veiwing windows all the way around so you can keep a close eye on all the fun. 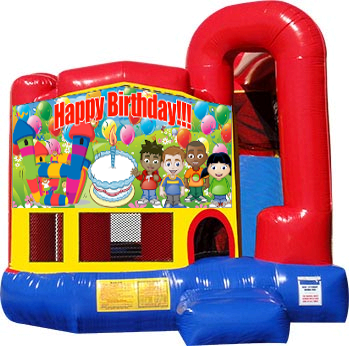 Rent this combo bouncer for your next birthday party and be the hero of your neighborhood.